These are my grandparents Louisa and Reginald enjoying an English country side picnic with a young son Frank. I would say this is about 1931. Roll the clock forward to spring 1956 and here's that same young man but holding me! 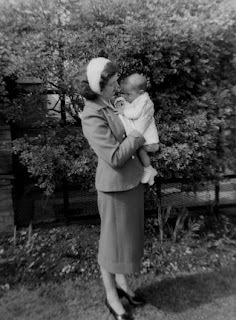 Here I am again with my mother Vivien, most likely in my grandparents garden. 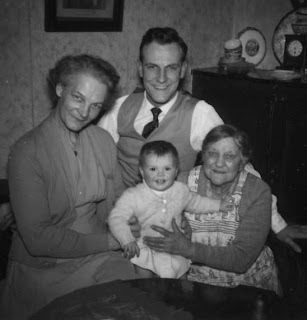 Here are four generations: me, my Dad, my grandmother and great grandmother and I believe this was 1957. My children's baby pictures are stored and I must scan them, but here are my son Chris and daughter Carrie some years back in the mid 1980's. They were all dressed up for a family member's wedding and enjoying themselves! 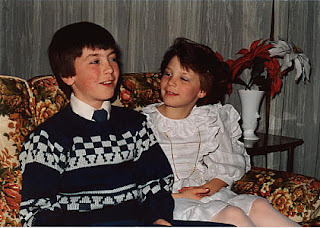 Both are quite grown up and married, with busy lives, jobs and friends and in laws. The time flies by and they grow up so fast! 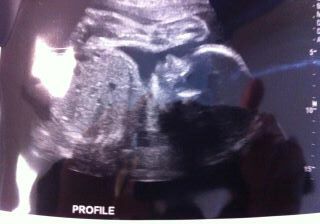 Its a picture of a monitor screen so pardon the shadow but if you look carefully, you will see a little face! We are about to become grandparents in 12 weeks time! We are just thrilled! Then the weaver in me went into panic mode.... and I have been busy planning a baby blanket. I'm going to use a draft I've used before and weave three. All details on draft and such will be posted at another entry but for now the warp is 8/2 cotton, 22 ends per inch and 7.5 yards long and 36 inches wide. My last blankets were 24 ends per inch but I thought it could be a bit more open, but not by much. I put a 'big push' on and just finished winding this warp of over 800 ends just before supper last night! Still a lot of work to go but the first major hurdle is done. I have finally finished twisting the fringes on the three scarves that came off this loom and they are now ready for beading. There isn't much warp left for the snowflake runners left and so the last one will be a bit shorter than I was expecting! 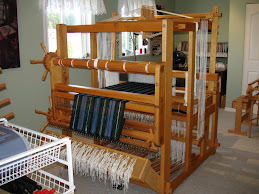 I'm busy planning a shawl warp for this loom so best get busy on that! There is lots going on and all in progress but nothing ready for their close up (sorry). My belated Christmas gifts to myself have been arriving in the post and I hope to play these cd rom's soon and freshen up my perspective on warping and general weaving techniques. Interweave Press had a 60% off sale and I couldn't resist! Heck, they are by Madelyn van der Hoogt and I reckon she knows more about this stuff than I do so it couldn't hurt my skill levels any :) I like to try new ideas out from time to time and see if there is anything I could be doing better. Bad habits and ruts can creep up on you before you know it! A postal card tells me my yarn order has finally arrived (ordered from Webs on December 6th!) and is ready for pick up so that will be a fun trip to town. All these goodies were funded by my recent Christmas sales but the party is coming to an end. One last gizmo gift to show you and this time its courtesy of our Airmiles points. I'm almost embarrassed to show you this picture as it all came from my so called fresh clean carpet! I suspect that a lot of this is lint from deep in the carpet from weaving things like tencel as it sheds a lot. Needless to say, we are impressed! The company even has a model that washes floors (bathroom and kitchen) I like where this is all going! It cleaned while I wove. What's not to like?? I briefly mentioned crackle weave in my last post and later I even got a request to cover it so apparently its time has come! I did the first level of the Guild of Canadian Weavers test program (they have a newly designed web page!) and so I have done some in depth study of several weave structures and that included Crackle or Jamtlandvaev. If you click on the link under crackle, it will take you to a downloadable file at Handweaving.net and shows the original article by Mary Meigs Atwater. The link under Mary's name will take you to an older post of mine where I do a review of the book featuring the story of her amazing life. You don't have to be a weaver to enjoy her story and she literally packed six lifetimes into one! So if you are planning a project for upholstery fabric, then crackle fits the bill nicely. There are no long floats and the weave structure is tied down every fourth thread. Upholstery textiles needs tie downs as chair cushions can get a lot of abrasion! It also works well for blankets for babies as you don't want long floats to catch little fingers. True classic crackle never has more than a three thread float. (but there are other variations that will go as far as five ends.) We are sticking to the classic version for now. Each threading group uses only three shafts and four warp threads. It is a two shuttle weave with pattern weft shots and tabby shots alternating in between. As with other two shuttle weaves, you are weaving a plain weave ground cloth and have pattern weft shots as well. A good beat is required! Proper shuttle rotation will lock the wefts at the edge for a neat appearance or if this is fabric for a sewing project, then it is usual to carry the threads up the selvedges. Crackle is more complex than summer and winter weave as it weaves two pattern blocks at the same time. If you weave block A, you also weave D. If you weave block B, you also weave block A. Then if you weave block C, you also get block B. Lastly, if you weave D you also get block C. Its like a two for one special with no limits on the order! See the photo of the paper draft to see the blocks involved. The draft shows the tabby shots in the drawdown. Click to enlarge for detail! The end results, especially if several colours are used, are quite visually complex! We are sticking to a four shaft crackle for now but you can see where an eight shaft crackle could get very involved! If you visualize the threadings in your mind or take another look at the paper draft above, you will see they are tiny little point twills and even look suspiciously like a close cousin to overshot. (overshot flows from one threading group to another with two threading groups sharing a common thread) It is common to repeat at least two threadings of a group and this becomes a unit. ( I used three groupings to form a unit in the draft above) Then you use multiple units in the designing. More on units or unit weaves at another time! With crackle you can thread as many block A's together as you like but when you shift to B there is a bit of a disconnect so how do you get the groups to flow? This is where the incidentals come to the rescue! So when you want to shift from block A and design with block B you add an incidental thread on shaft 1 and the two groups join up nicely! So you add the corresponding number 2 as you shift from B to C. You must also add them if you go in reverse! How do you remember which one to use and which number goes with each block? Simple. Change the name of the blocks from A, B, C and D to 1, 2, 3, 4. The number is the incidental you need! Now books will show a crackle draft, especially profile drafts, as A, B, C and D still so you will have to convert them to this. So let's say that your particular pattern is better if you have blocks of A and then C. No B's at all. You can do this! When designing using A you add the incidental for the missing B and then also for the preferred block of C. You must use the connecting incidental for B even though you won't be using the B units. This rule applies to joining up any group combination. Remember to do this either going forward or backwards in your groups. Clear as mud? Take a minute to read the last three sections again and take another look at the paper draft and see the circled incidentals in place. No typo there.... A,C,D is 1,2,3,4 Don't forget you are adding incidentals for blocks that are not being used so to transition to the next block you are using! Once you have this under your belt, then you are free to play and design! I find my weaving program invaluable for times like this as you can shift blocks around and get the design in your mind onto the screen. Multi shaft designs will have assigned threadings for shafts 5 to 8 (for example) and might be labeled E, F, G, H but they are also 5, 6, 7, 8! Helpful Tip: At the loom I tape a threading print out from my PCW Fiberworks program and then use two small mini 'post it note's' to isolate the grouping I'm working on and then advance the notes carefully to the incidental required and then again to the new block being threaded next. It can be very easy to lose your place with crackle threadings and so I recommend you take measures to keep track! Now for some show and tell. This sample show my understanding of block placement and not colour interaction. So this is why there is a single solid colour for the pattern. The blocks were woven in a climbing sequence A, B, C, D. look at the bottom corner and see block A. Notice block D in the centre of the diamond. It came along for the ride! If you visually pinpoint the block being treadled on the angle, you can see the additional woven bonus block. Finally at D they descend in reverse order to A and so on. This is crackle woven 'overshot style'. Literally woven using a summer and winter treadling. If you'd like to do more reading on this topic, this link takes you to a PDF which explores four shaft classic arrangement, variations with longer floats and multi shaft designs. There are some great designs that show the beautiful designs possible. This book is fairly new on the market and having spent some time reviewing it, I can assure you its worth every penny! It explains everything I told you above (more clearly and with much better diagrams) and then goes onto much more and has all the beautiful pictures to show you what colour can do with this weave structure! Its timing couldn't be better in my opinion as there has been relatively few books to turn to on crackle. 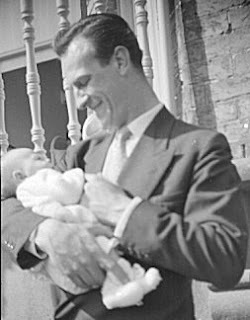 This has been a standard by Mary E. Snyder and while filled with good information, is rather sparse, limited to four shafts, and only black and white images. I know there is a wealth of information on crackle at Peg's blog Talking About Weaving Peg isn't active at her blog right now but if you type in crackle weave into her 'search this blog' box and you can surf her past posts on her exploration of crackle. She loves this weave structure! The beauty of weaving in this time period of history in which we live is that you can simply google crackle weave and read more on line. You still need to understand the basic rules of Classic Crackle.... so as you progress in this study, you can bend and break the rules. Thank you for all the kind emails regarding my four years of blogging! The guest towels are on their way to all the winners and I'm looking forward to hearing what they think. I'm back in the studio again but there's just a continuation of the older projects that were stuck in limbo during Christmas and the health crisis. New projects are being planned and so I should have more to show you soon. Speaking of the health crisis: Bruce is much improved and now walking with no crutches or cane, no more antibiotics and is regaining his strength. The heel/ foot gets tired and so he needs rests but I know he's getting better as he's arguing with me about what he thinks he can do. The wives out there will recognize that one and sympathize I'm sure! Winter 2012 has finally shown up. That's the view from the house and just a dusting of snow. With luck, it will be all we get.... but I see its started falling again. I'm calling it a 'snow day off' anyway..
Picasa says I have 5008 images stored there from posting to my blog! I found one reader who had signed up twice so could only count them once and I also discovered two readers opted to follow me 'privately' which means their identities are unknown. They simply show up in the count but no names. Sadly I can't include you because of this and I wish I could. I have over 8 screen loads of people to record on little slips of paper! Through what you were willing to share when you signed up, I could see where you live in some cases, what your other interests are, and who else you follow. There have been over 108 thousand page views and well on the way to 109! Its all a bit overwhelming given that this time 4 years ago I tentatively pushed the publish button for the very first time and wondered who on earth would be interested in reading what I have to say!? Here's Lynnette and myself this afternoon about to do the deed! June * has a turquoise generic exclamation point for an image and is on the first screen of followers you see. If this is You, then please email me at weeverwoman@yahoo.com For some reason, the friend connect thing won't let me 'connect'. Rocky Top Weaver or Annali lives in Oregon and has been weaving 2 1/2 years. Martha VA has a blog and was from Rochester, New York and now resides in Virginia. She is also a new weaver. Please contact me with your addresses and we'll get the guest towels moving through the Post to you! Now the rest of you are no doubt feeling somewhat crest fallen at having missed out, so perhaps I can cheer you up with some recommendations for spending some of your left over Christmas money? I have ordered some books, cd rom's and (new to me) yarn with my sale proceeds and so far only the books have appeared! I'll report on the rest as and when they appear. In the meantime I'm looking forward to digging into these gems! This one is thanks to my daughter who gave me an Amazon online gift certificate... thanks Carrie! Crackle is one of those weave structures that looks incredibly complex on four shafts and amazing on multi shafts! There are some rules to designing with Crackle blocks and perhaps we can chat about them here on a another post? New Weaver? Want to learn how to modify or create your own drafts? Then this book may be for you! Our condolences to Theresa and Gene as they have lost one of their beloved brood. Dennett who just reached 19 years old has sadly passed away. Having lost our Connor just over a year ago, we understand. On the home front, hubby Bruce has had improvements in some areas and a step back in others. This situation is not going quietly into the dark and so we will continue to follow up with doctors and soldier on! Lastly, I'm happy to report that life has settled down enough that I have picked up a shuttle and resuming where I left off nearly 9 weeks ago (has it really been that long?) I feel a little rusty as you can imagine! But the weaving new year is finally now underway!